Early tomorrow morning I leave for an 8-Day/7-Night white water rafting trip covering 190 miles of Colorado River. This trip is organized by Answers in Genesis and Canyon Ministries. In cooperation with AIG, Canyon Ministries launched in 2008 a program called the “Christian Scholar’ Trip.” Scholarships have been provided for 24 professors and theologians from seminaries and Bible colleges from around the world. On June 21 I will fly to Las Vegas and will have dinner with a number of men going on the trip. On the following morning, we will leave for the Marble Canyon. The following day, June 23, we will meet our river crew at the Old Marble Canyon Lodge. They will then take us to our river launch point. The river portion of our trip ends early in the morning on June 29 at Whitemore Wash. From there we are given a scenic 8-minute helicopter ride to the Bar Ten Ranch. At this ranch, we will be able to freshen up for our flight back to Las Vegas. From Vegas, I will then return in the afternoon to Detroit. I have been looking forward to this trip for over a year (plans were being made in the spring of 2007). Since my areas of interest on Biblical Creationism focuses primarily on Genesis 1-2, there are facets of flood geology as it relates to the Grand Canyon where my knowledge needs to expand. This trip will be interesting for at least two reasons. First, the “Christian Scholars’ Trip focuses on educating both old earth and young earth creationists about how the geological details of the Grand Canyon concatenate with a literal interpretation of the Genesis Flood. Since I am a young earth creationist and have gone through some educational material on this subject, beginning in the early 1970s with Whitcomb and Morris’ The Genesis Flood, I look forward to detailed explanations, along with physical evidence from the Grand Canyon, showing how it relates to the biblical material. By the nature of this being a mixed group, this should allow for intriguing Q & A sessions. Second, Tom Vail, the President of Canyon Ministries, has an interesting background. 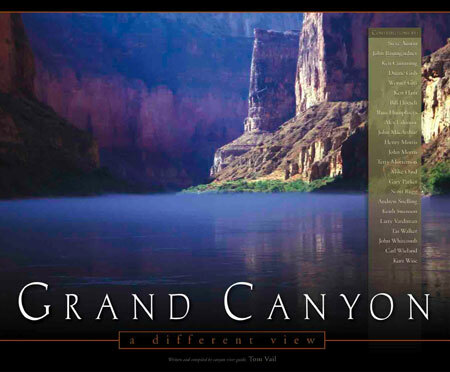 Tom left the corporate world in the early 1980s to become a canyon river tour guide through the Grand Canyon. He has also worked as a part-time guide for the Grand Canyon National Park Service and is a past-elected member of the board of directors for Grand Canyon River Guides. Until 1994 when he came to Christ, Tom guided tours through the Grand Canyon teaching an evolutionary model for the formation of the Grand Canyon. After his conversion, he developed a biblical creationist worldview that provided a superior explanation for the formation of the Grand Canyon. In 2003, he published Grand Canyon, a Different View. Needless to say, because of his biblical explanation of the Grand Canyon, this book has created some stir among his opponents. Tom’s background and expertise should make this an excellent trip. To read more about him, click here. When I return from the trip, I plan to post on my website a few pictures with commentary.